It has been 10 years since I last went to Paris. My last trip was just a two day business trip where I had a brief chance to do some site seeing in the evening with the help of my hosts. This weekend, I decided to take the Euro train from Waterloo and see some more of Paris. The journey started quite well and it was a comfortable relaxed train journey. I used the time to read the newspapers. All of the papers had articles on the Hezbollah victory and biographies on the Hezbollah leader, Sheikh Nassrollah. When I arrived at Paris de Nord station, it was truly a culture shock. It was as if I was not in France, for there were hardly any French people, except three French soldiers I saw walking around the station with guns. Their beret made me laugh though. It was like a huge Pizza stuck on their head, slightly tilted to one side. Had it not been for the guns they were carrying, I may have even thought they were French chefs. Perhaps thats why the French have never won a war. With those kind of hats no one would take them seriously. The station was so dirty and poorly maintained. There was water leaking from the pipes and the ceiling. If you have a few moans about London, go to parts of Paris. London compared to Paris on the whole is clean and well maintained, especially the tourist areas. Even around the Eifel tower, the statues are immersed in bird droppings and grifitti is every where. Champs Elysees, may once have been a pleasant walk, where the chic and the stylish paraded and one could relax sipping a drink in the many cafes there. The chic and the stylish however seem to have been replaced by the black clad Muslim women walking behind their bearded men, with only their eyes showing, if that. From the time you order your drink to when you finish, at least 4 or 5 beggars would have approached you. Add to all this, the exuberant prices they charge and the uncomfortable pollution, and you can forget about relaxing. The Metro, is so suffocating and drab, and I was surprised to see an underground system more depressing than the London Undergound. The hotel I stayed in was probably the worst, pound by pound, that I have ever stayed in. The room was so small, the bed almost ran into the toilet. I remember when I stayed in Paris last time, the hotel was not all that either and that was paid by a blue chip company, so I wasn't expecting much but this was taking the piss. The bathroom was so small, when you stepped out of the shower, you had to be careful not to fall in the toilet. There were a couple of highlights to the evening though. We went to the Moulin Rouge, a long queue of jovial, stylish people queued outside. It was the sort of scenery I was expecting to see in Paris. The show was sold out but we were guided to another place where they did a similar show, called the Eve. The show was brilliant and brought a smile back to our faces. Some really top quality acts of dancing, including the can acan, magic, acrobatics, singing and comedy. 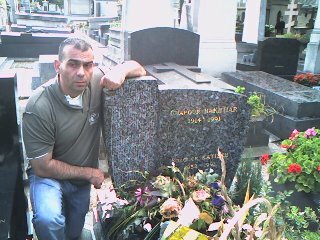 I was not planning this as I thought I would not have enough time, but the next day, when I saw written in front of a bus by the Arc de Triomphe, Montparnasse cemetery, I just had to jump on the bus. It is 15 years since Dr. Bakhriar was buried in the Montparnasse cemetery, and although I was a supporter of him, not being a religious or a spiritual person, I had never visited his grave before. To me it has been more important to continue his path rather than make a pilgrimage to his grave. Bakhtiar's grave was quite easy to find. The bus took us to the Montparnasse station, there after a short walk, at the very entrance, it has a list of famous people buried there. Bakhtiar's name is the only one under B. There were still flowers and bouquets on the graves of Shapour Bakhtiar and Soroush Katibeh, as the anniversary of their murder by the Islamic Republic agenst was only a couple of weeks ago. Nevertheless, it was sad to be by the remains of a man who desperately tried to warn our people of the catastrophe there was to come as a result of mixing religion and politics. Shame not enough Iranians listened to him and more than regretted it later. LOL at your Paris experience. If you don't mind could you upload any pictures from the late Prime Minister's resting place?